This is one of those recipes that you know is going to be good even before you make it. I mean seriously. 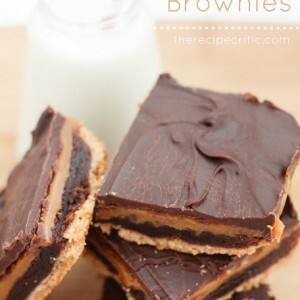 A cookie along the bottom, brownie in the center, and caramel layer and chocolate on top? Grease the bottom of a 9×13 pan. I would highly suggest lining the pan with parchment paper. This made it very easy to lift out of the pan and cut the brownies. Put the cookies into a food processor until very fine. In a medium bowl melt the butter. Add the cookies to this and mix until moist. Press into the bottom of the 9×13 pan. Prepare the brownie mix as directed on the box but also add in the 1/4 cup of fudge topping. Spread on top of cookie. Cook the brownie mix as directed and let it cool completely. Melt cream and caramels together over medium low heat on the stove until caramels are melted and creamy. Pour this evenly on top of the cooled brownies. Let cool until set. You can speed up the process by placing the brownies in the freezer for about 15 minutes. Lastly, melt the chocolate, butter and heavy cream together and pour over the caramel layer. Let this cool. Serve and enjoy.